Choose from our range of Korean Air flight tickets from Hong Kong to worldwide destinations below. Talk to one of Flight Centre's consultants to make a booking or get a quote. If you can't find the destination you're looking for, contact one of our friendly consultants on 2830 2899 or enquire online now. If you are looking to change an existing booking made directly with Korean Air, please contact the airline. 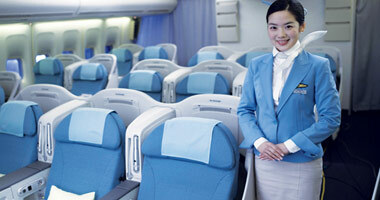 Find cheap Korean Air airfares from Hong Kong now! Choose one of their popular destinations below or contact 2830 2899 today and ask about our great Korean Air deals. Our all-in fares include taxes and fuel surcharges. 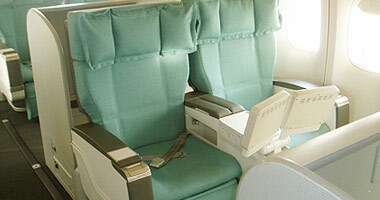 Korean’s economy class cabin is the affordable yet comfortable way to fly. Fitted with the latest slim line seats for superior room and comfort, the ergonomic seats offer some of the best leg room in the industry with a sliding seat cushion and excellent recline. Moveable headrests provide additional comfort in the way of head and neck support. Each seat is also fitted with a USB port which allows passengers to use and recharge their personal devices. Entertainment: A ten and half inch high resolution video screen is available at each seat for on-demand audio-video entertainment. In-flight programming includes the latest movie blockbusters, international films, a range of TV series and a huge collection of music. Passengers may view their own entertainment on their laptops or tablets with the handy USB port provided at each seat. Food and Beverage: A complimentary hot meal choice and beverage service is available on all international flights. Meal options will include regional favourites depending on the origin and destination of the flight. Beer, Wine and spirits are available in addition to juices, soft drinks, coffee and tea. Step into a cabin of refined elegance with roomy armchair seats that transform into a fully lie-flat bed. The extra wide seats are cleverly designed with all the comforts one would expect in a business class cabin. A fully adjustable foot rest and back support can be easily controlled with the touch of a button. Privacy is another aspect that makes Business Class so special. Seats are set within their own shell and seat dividers can be raised for additional privacy. Entertainment: Wide LCD screens are featured at each seat for the latest in audio video on-demand (AVOD) entertainment. Select from a wide range of programming, including movies, television shows, music and games. A USB port is conveniently located at each seat for easy recharge of laptops and tablets. A selection of international newspapers and magazines are also available. Food and Beverage: Experience fine dining in the sky with chef prepared meals, linens and real crockery and cutlery. Order from an extensive menu filled with Asian and Western dishes, all individually prepared and served at your business class table. Pair your dinner with a fine wine or any other beverage of your choice. Wood finish trim decorates the first class sleeper suites in Korean’s most luxurious cabin. Enjoy the finest service and personal attention from a dedicated cabin staff and sink into one of the most cosy seats in the sky. Technological advancements in seat design ensure the most comfortable flight possible with a fully adjustable seat that can be positioned to any angle – including a fully lie flat arrangement which forms into a full length bed. Work or relax in complete privacy while you enjoy the suite amenities such as a large table, USB ports, a large video screen and adjustable reading light. Entertainment: Premium Bose noise-cancelling headsets are featured in First Class. These award winning headphones block out ambient noise and enhance listening and viewing pleasure while enjoying the long list of in-flight entertainment. Each sleeper suite features a large video screen for on-demand entertainment. Each seat also comes equipped with USB ports and laptop power points for continued enjoyment of personal electronic devices. A wide selection of newspapers and magazines are also provided. Food and Beverage: Korean provides an extensive menu in First Class with meal choices ranging from western dishes to Chinese, Japanese and Korean cuisine. A complete table setting is laid out for each guest with a linen table cloth and quality crockery and cutlery. Chef prepared meals are plated and served individually and paired with the finest wines. Korean’s carry-on regulations permit one piece of hand luggage plus one small personal item for economy class passengers. Personal items include a small backpack or handbag. The maximum total weight of these items is 12kg (26lbs). Prestige Business and First Class passengers are allowed 2 pieces of cabin luggage with a total maximum weight of 18kg (40lbs). Restricted items in carry-on luggage include sharp and pointed objects and liquids and gels in quantities greater than 100ml. Economy: Travelling to or from the Americas, 2 pieces are allowed with a maximum weight of 23kg (50lbs) per bag. All other destinations have a 1 piece allowance with a maximum weight of 23kg (50lbs). Prestige Business: Regardless of origin or destination, guests travelling in Prestige Business are allowed 2 bags with a maximum weight of 32kg (70lbs) each. First: Guests are allowed three checked bags irrespective of origin or destination point. The weight of each piece must not exceed 32kg (70lbs). The total linear dimensions (length + width + depth) must not be greater than 158cm (62”). Bags or items weighing more than 23kg (50lbs) will be charged an overweight fee. Additionally, bags greater than 158cm (62”) in size will be charged the applicable oversize fee. In many cases, sporting equipment may be included as part of the free baggage allowance however there are special packing requirements for items such as bicycles, golf clubs, scuba gear and ski equipment. Be sure to check with your Flight Centre Consultant for these instructions. Pets may be checked in or may be carried in the cabin. Pets will be accepted in the cabin only if the animal and carry case together, weigh less than 5kg (11lbs). Pet regulations vary depending on the destination. Check with your Flight Centre Travel Consultant for any special requirements. 32kg (70lbs) is the maximum weight that will be accepted for a single bag. The maximum linear dimensions per bag are 277cm (109”). Infants under the age of 2 are permitted to check one collapsible stroller or car seat plus one bag. The size and weight limitations are 115cm (45”) and 10kg (22lbs). One additional small carry-on item is allowed when travelling with an infant. Dangerous Goods are restricted items that can interfere with the safe operation of flight. Dangerous goods are never allowed in checked luggage or in cabin baggage. These items include flammable materials, gasses or liquids, fireworks and explosives, corrosives and radioactive materials, poisons, paints and any other toxic liquid or material. Always declare questionable items to airline staff at check-in. Counter check-in is available for all guests and there are designated lanes for Prestige Business and First Class passengers. Guests that must use the counter for check-in are those on a group booking of 9 or more, passengers travelling on code-share flights operated by another airline and those requiring special assistance such as wheelchair guests and unaccompanied minors. It is recommended that guests check in for their international flight at least 2 hours before departure. Guests may check-in online between 2 and 24 hours before departure. Seat selection can be made and boarding passes are available for print out. From the homepage, simply click on “Web Check-In” and follow the prompts. Upon arriving at the airport, proceed to the bag drop off counter where passports and travel documentation will be checked. Currently, boarding passes can be printed off remotely from 66 locations throughout the Korean Air Lines network. Airport kiosks are available at selected airports. Convenient kiosk machines are located in front of the check-in counter. It’s as simple as entering the reservation number or passenger name, select the number of bags to check and print off the boarding pass. Once you drop your bags off at the counter, you’re ready to fly. Relax in the inviting atmosphere of a KAL Lounge. Found at several airports in the KAL network, these comfortable spaces let you work, rest or enjoy a meal and drink before departure. Other features include Wi-Fi, newspapers and magazines, free local phone calls and shower and sleeping areas. Lounges are open to First and Prestige Business flyers, Skypass Million Miler and Morning Club Premium members as well as Skyteam Elite members who are travelling on the same day on a Skyteam alliance flight. These guests may also use Skyteam alliance member lounges with hundreds of locations around the world. Korean’s Skypass programme rewards guests who travel regularly with Korean Air Lines and other Skyteam Alliance airlines. This recognition programme features benefits such as award travel, upgrades, lounge access and more. The higher the status level, the more benefits become available, and each elite level offers its own benefits. For travellers who have accrued at least 50,000 points, benefits include priority baggage handling and an extra 10kg baggage allowance as well as a designated check-in counter. This tier is for members who have accumulated between 500,000 miles and 999,999. In addition to Morning Calm benefits, Premium perks include access to lounges, an additional baggage allowance of 20kg and two waived black-out dates for award travel. The highest Skypass tier, the Million Miler Club is valid for lifetime membership. Additional benefits such as unlimited blackout dates for award travel, an exclusive phone number for travel assistance and an extra baggage allowance of 30kg. Seoul based Korean Air is the flagship carrier of South Korea. It services 45 countries and is ranked among the top 20 airlines for passenger numbers.